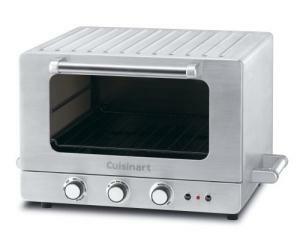 Cuisinart has designed a neat way to get brick oven results from a countertop appliance. Genuine brick inserts are built into the oven sides and a removable baking stone is included to surround your food with the special quality of heat that stone can produce. The oven may take a bit more time to preheat and bring the bricks up to temperature, but it isn't a significant amount of time as the inserts don't have the full thickness of a regular brick to heat. The machine enables you to produce better crusts through its style of baking, and crispy foods that mimic fried. You'll notice the difference in the taste, texture and appearance of your foods. This restaurant quality oven has three cooking options and reaches temperatures up to five hundred degrees. You can bake, broil, or toast using the included baking tray and two oven racks, while the drip pan catches any spills. The glass door is tinted. A nonstick coating has been applied to the interior surfaces where there are no bricks in order to facilitate cleaning. The unit has an oven light for monitoring the progress of your meal. The stainless steel housing is durable and matches any decor. Other models include even more features, such as an added rotisserie rack.